Summer is a time for relaxing, spending time with loved ones, and enjoying the great outdoors. Most people enjoy the summer months. Although the weather can be beautiful, summer is not without risks. 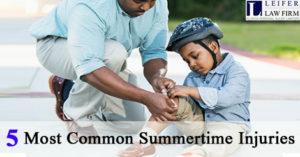 Boca Raton personal injury lawyers tend to see certain types of summertime injuries on a regular basis. If you know what kinds of activities to avoid – or just enjoy more safely – you can lower your risk of getting sidelined by an injury this summer. Most people don’t associate grills and barbeques with a high risk of injury, but grills are actually a leading cause of injuries in the summer months. In 2009 alone, almost 18,000 people were sent to the emergency room due to grilling accidents. In most cases, the injury victims sustained burn injuries. Experts warn that grills can ignite very easily, throwing flames much farther than you might expect. Since 2005, the Consumer Product Safety Commission has recalled 24 gas grills due to safety concerns and manufacturing flaws. People have also been seriously injured after accidentally swallowing a grill brush bristle. These heavy duty brushes are made of small metal wires that can cause severe damage to the throat and intestines when ingested. In 2015, a 16-year-old girl was saved after doctors discovered a wire grill brush bristle in her abdomen during exploratory surgery. Without the surgery, she could have developed a deadly obstruction or infection. Cutting the grass is a routine chore during warm weather. When lawn mowing equipment malfunctions or is defective, it can be a hazardous chore. Every year, 80,000 Americans are injured in lawnmower accidents. In some cases, these injuries are caused by defective equipment. In other cases, lawn mowing accidents happen when an individual strikes a rock or some other kind of debris while mowing. Floridians are quite familiar with mosquitoes and many other kinds of insects. Mosquitoes are particularly problematic in the hot, humid Florida summers. They can transmit numerous diseases, including West Nile Virus and the Zika Virus. In Florida, mosquitoes can also carry St. Louis Encephalitis, which is especially dangerous for the very elderly and the very young. Car accidents happen throughout the year, but they peak during the summer months. Many people see Memorial Day as summer’s official kickoff. Unfortunately, Memorial Day also marks the start of what safety experts have come to call the “100 deadliest days” for teen drivers. If you are a parent, it’s important to talk to your teen driver about the importance of staying safe behind the wheel – both during the summer and all other times throughout the year. When the weather heats up, many people head to the pool or the beach. Drowning accidents, as well as other pool-related accidents, increase during the summer months. The Consumer Product Safety Commission’s Pool Safely website is a great resource for parents and caregivers. A personal injury can leave you with physical pain, emotional distress, medical bills, and many other inconveniences. When you’re hurt in the summer, an injury can stop you from relaxing and spending time doing things you enjoy. Don’t end up paying for another person’s negligence. Choose a personal injury lawyer who can help you protect your rights. If you have been injured in an accident, contact an experienced Boca Raton personal injury lawyer today.